Who owns the asteroids in our solar system? It may seem strange, but Congress hopes to answer over the next few months with a new bill that is currently being reviewed by the Senate. The SPACE Act bill, if passed, will allow private companies to mine asteroids and sell whatever they dig up. This is great news for companies like Planetary Resources and Deep Space Industries (DSI) who have already invested millions of dollars into this exact concept. Companies are particularly focused on asteroids that consist of metals that are rare to us on Earth or asteroids that contain large amounts of water which, with the right technology, can be converted to rocket fuel and oxygen. There are some unbelievably valuable rocks flying around in our solar system. The website Asterank uses information about asteroid sizes and composition, along with current market prices to calculate the most valuable known asteroids. Some are estimated to be worth more 100 trillion dollars. It’s a number large enough to turn any potential investor’s head. There is one caveat — these are estimates based on the limited data we currently have on asteroids. Beyond the limited data, many of these asteroids are far away and in undesirable orbits that would make them particularly difficult and costly to mine. Still, there are asteroids that may be well worth the effort. But they’re value is complicated by significant unknowns. Asteroids are relatively small and dark bodies in our solar system that are hard to analyze from the ground. We’ve only directly identified less than a million of the largest asteroids, but scientists estimate that our solar system contains over a 100 million smaller asteroids, giving companies plenty of potential real estate to choose from. Both asteroid mining companies, Planetary Resources and DSI are currently focused on this exact aspect of the mission: prospecting asteroids to identify the most valuable interplanetary real estate. Determining an asteroid’s value is an important first step because one of the challenges associated with rare metal focused asteroid mining is the fact that bringing back objects from space is an incredible technical and financial challenge. This is why most space missions today are designed to collect all of the necessary scientific data at a given planetary body rather than bring coveted samples back to Earth. Scientists would generally prefer to have a sample in hand to analyze, but that’s not usually feasible. It’s just not worth the money it would take to do it. Obviously with rare metal focused asteroid mining bringing the material back to Earth is a necessary aspect of the mission. This means that identifying an asteroid with a sufficient amount of valuable metal is crucial. With water focused asteroid mining, the return trip isn’t an issue because you want to keep the water in space. The idea with this strategy is to convert that water into rocket fuel and oxygen. By doing this one could develop interplanetary stops where traveling spacecraft fuel up and go farther into the solar system. Like rare metal focused mining, identifying the right asteroid with a sufficient amount of this valuable resource is critical. Planetary Resources, led by President and Chief Engineer Chris Lewicki, was the first major asteroid mining company to release their ambitious plans. Behind that ambition was key expertise and deep pockets. Lewicki played a crucial role in successfully placing two NASA Rovers and a Lander on the surface of Mars and the company’s list of investors include Google CEO Larry Page, filmmaker James Cameron, and Sir Richard Branson. Planetary Resources is working to perfect their Arkyd spacecraft that will eventually be launched as a fleet into the solar system to image and characterize promising asteroids. This will lead to a unique strategy in the space business. Rather than building a single highly customized spacecraft for only one mission, Planetary Resources hopes to eventually mass produce a swarm of these machines, reducing the per-spacecraft cost and time for development. They first Arkyd spacecraft launched to the International Space Station earlier this year and it will be deployed into space to test its prospecting subsystems later this month. The spacecraft design will continue to be perfected over a series of launches in the next few years before Planetary Resources moves on to prospecting work. In the meantime, before the company has a chance to tap into the multi-trillion dollar asteroid mining market, it plans to make money from the Arkyd spacecraft itself. The prospecting spacecraft can be pointed back at the Earth which will enable Planetary Resources to sell scientific information to universities, business, and government. They’ve even said that the spacecraft itself will be on the market for private scientific work. Planetary Resources’ competitor, DSI, plans to follow a similar business model. They have their own prospecting spacecraft called FireFly that they plan to launch later this year. Like Planetary Resources, DSI will launch FireFly as a fleet to identify valuable asteroids. Unlike Planetary Resources, DSI intends to send their first generation spacecraft directly on close fly-bys of promising asteroids, rather than keeping them in Earth’s orbit. Additionally, DSI intends to leverage the capabilities of FireFly to make money as they work their way toward the ultimate goal of mining asteroids. The optimal way to mine an asteroid has been studied and debated for decades. In general, the technology required to mine an asteroid depends on the type of asteroid you’re working with. This is where the Arkyd and FireFly spacecraft play a pivotal role. The asteroid’s composition, mass, density, rate of rotation, and precise orbital trajectory will all be factors. Humans have successfully rendezvous robotic probes onto the surface of asteroids or comets only three times before (Japan’s Hayabusa mission, NASA’s NEAR-Shoemaker mission, Europe’s Rosetta Mission), and never to mine them. An asteroid rendezvous is technologically tricky for a number of reasons. Asteroids spin and they orbit the sun at thousands of miles per hour. They’re also relatively small in mass and won’t provide enough gravitational force to hold a spacecraft securely to its surface. Successfully rendezvousing and securing the spacecraft will be challenging enough without the additional requirement of mining, and processing materials in space. For both Planetary Resources and DSI, bringing in sufficient revenue to develop these necessary asteroid mining technologies, and survive as a company long enough to test them out, will be key to their success. Once the technology is ready, Congress will have more questions to answer. What happens when multiple companies want to mine the same asteroid? How should an influx of rare Earth metals affect their market price? How can we ensure the technology used to rendezvous and capture an asteroid won’t be used to divert that asteroid toward a location on the Earth? For now, giving the “go ahead” to companies hoping to make money off of asteroids is the first step to furthering the technology necessary to tap into this new, potentially multi-trillion dollar industry. COMMENTARY: On March 15, 2015, NASA and Planetary Resources have announced a new desktop app that incorporates algorithms from a contest that challenged researchers to detect asteroids with greater accuracy. The Asteroid Data Hunter app runs on Windows and Mac, with a Linux version coming soon. Planetary Resources, the asteroid mining company based in Redmond, Wash., says the contest resulted in an overall improvement of 15 percent in the positive identification of algorithms in the main belt between Mars and Jupiter. The results were released by NASA at South by Southwest in Austin, Texas, over the weekend. The contest, part of NASA’s Asteroid Grand Challenge, awarded a total of $55,000 in prizes to those who developed the algorithms. NASA and Planetary Resources in a news release announcing the results, said. Planetary Resources was founded in November 2010. Key individual investors include Google co-founder and CEO Larry Page, Google Executive Chairman Eric Schmidt, Founder and CEO of Virgin Group Sir Richard Branson, Perot Systems CEO Ross Perot, Jr., Charles Simonyi, PhD, real estate developer Rena Shulsky David and film producer and director James Cameron. Key venture investment firms include I2BF, OS Fund and Sherpalo Ventures. Deep Space Industries, or DSI, is a privately-held American company in the asteroid mining sector with plans to offer general utility commercial space services beginning in approximately 2016. The company was formally announced on January 22, 2013, nine months after the announcement of the first asteroid-mining firm, Planetary Resources. DSI's notional service offerings in the late-2010s and early 2020s include space-based refueling, power, asteroid processing, and manufacturing. The first spacecraft proposed by Deep Space Industries, the 25 kg (55 lb) FireFly, is designed to search for suitable asteroids for mining. Constructed using inexpensive CubeSat components, FireFly is projected to fly in 2015, sharing rockets with much larger communications satellites in order to reduce costs. DSI's second planned satellite, known as the DragonFly, is predicted by the company to launch starting in 2016 to bring up to 150 kilograms (330 lb) of asteroid material to the surface of Earth. A third design was proposed in 2014: a DSI "mothership" that could carry up to a dozen nanosats to beyond Earth orbits. This larger craft would be approximately 0.91 m × 0.46 m (3 ft × 1.5 ft) and mass about 150 kilograms (330 lb). The smaller probe sats that could be carried would be approximately 15 cm (6 in) cubes. The mothership would provide deep space communication capability with Earth for the entire swarm of smallsats. By 2023, DSI hopes to begin actively mining asteroids for their metals and water. A newly unveiled company with some high-profile backers — including filmmaker James Cameron and Google co-founder Larry Page — is set to announce plans to mine near-Earth asteroids for resources such as precious metals and water. Planetary Resources, Inc. intends to sell these materials, generating a healthy profit for itself. But it also aims to advance humanity's exploration and exploitation of space, with resource extraction serving as an anchor industry that helps our species spread throughout the solar system. Planetary Resources co-founder and co-chairman Eric Anderson told SPACE.com. "If you look at space resources, the logical next step is to go to the near-Earth asteroids, They're just so valuable, and so easy to reach energetically. Near-Earth asteroids really are the low-hanging fruit of the solar system." Planetary Resources is officially unveiling its asteroid-mining plans at 1:30 p.m. EDT (1730 GMT) Tuesday (April 24) during a news conference at Seattle's Museum of Flight. Two of the resources the company plans to mine are platinum-group metals and water, Anderson said. Platinum-group metals — ruthenium, rhodium, palladium, osmium, iridium, and platinum — are found in low concentrations on Earth and can be tough to access, which is why they're so expensive. In fact, Anderson said, they don't occur naturally in Earth's crust, having been deposited on our planet over the eons by asteroid impacts. "We're going to go to the source. The platinum-group metals are many orders of magnitude easier to access in the high-concentration platinum asteroids than they are in the Earth's crust." And there are a lot of precious metals up there waiting to be mined. A single platinum-rich space rock 1,650 feet (500 meters) wide contains the equivalent of all the platinum-group metals ever mined throughout human history, company officials said. Planetary Resources co-founder and co-chairman Peter Diamandis said in a statement. "When the availability of these metals increase[s], the cost will reduce on everything including defibrillators, hand-held devices, TV and computer monitors, catalysts. And with the abundance of these metals, we’ll be able to use them in mass production, like in automotive fuel cells." Many asteroids are rich in water, too, another characteristic the company plans to exploit. Once extracted, this water would be sold in space, providing significant savings over water launched from the ground. Asteroid water could help astronauts stay hydrated and grow food, provide radiation shielding for spaceships and be broken into its constituent hydrogen and oxygen, the chief components of rocket fuel, Anderson said. Planetary Resources hopes its mining efforts lead to the establishment of in-space "gas stations" that could help many spacecraft refuel, from Earth-orbiting satellites to Mars-bound vessels. "We're really talking about enabling the exploration of deep space. That's what really gets me excited." In addition to Page, Planetary Resources counts among its investors Ross Perot Jr., chairman of The Perot Group and son of the former presidential candidate; Eric Schmidt, executive chairman of Google; K. Ram Shriram, Google board of directors founding member; and Charles Simonyi, chairman of Intentional Intentional Software Corp, who has taken two tourist flights to the International Space Station. Cameron serves the company as an adviser, as does former NASA space shuttle astronaut Tom Jones. The company is not ready to break ground on an asteroid just yet. Before that can happen, it needs to do some in-depth prospecting work. Of the roughly 8,900 known near-Earth asteroids, perhaps 100 or 150 are water-rich and easier to reach than the surface of the moon, Anderson said. Planetary Resources wants to identify and characterize these top targets before it does anything else. To that end, it has designed a high-performance, low-cost space telescope that Anderson said should launch to low-Earth orbit within the next 18 to 24 months. This telescope will make observations of its own but also serve as a model for future instruments that will journey near promising asteroids and peer at them in great detail. The prospecting phase should take a couple of years or so, Anderson added. "We will then, at that time, determine which of these objects to pursue first for resource extraction, and what mission we'll be facilitating," he said. "Before you decide where to put the gas station, you've got to understand where the trucks are going to be driving by." Mining activities will be enabled by swarms of unmanned spacecraft, according to company materials. Planetary Resources will focus on near-Earth asteroids, with no immediate plans to extend its reach to the asteroid belt between Mars and Jupiter or to the surface of the moon, Anderson said. He declined to estimate when Planetary Resources would begin extracting metals or water from space rocks, saying there are too many variables to lay out a firm timeline. But a recent study sponsored by Caltech's Keck Institute for Space Studies estimated that a 500-ton near-Earth asteroid could be snagged and dragged to the moon's orbit by 2025, at a cost of about $2.6 billion. Whatever Planetary Resources' exact schedule may be, Anderson said the company is already well on its way to making things happen. "We're out there right now, talking to customers. We are open for discussions with companies — aerospace companies, mining companies, prospecting companies, resource companies. We're out working in that field, to really open up the solar system for business." COMMENTARY: You know, I love big dreams, huge challenges, but this is just so much crock. Anderson makes it sound like all near-Earth asteroids are oozing with precious metals like platinum and gold ready to be mined. That's just not the case. Locating the right asteroids will take time, and finding those containing precious metals, and in sufficient quantities to make the venture economically feasible will take even longer. "Snagging" an astroid is not going to be an easy thing either. They rotate and wobble, and many of them are just plain huge. Towing the "snagged" asteroid will be a challenge. It is going to take a huge rocket. The best asteroids will probably contain ice that could be converted into water and then into hydrogen that could be used to fuel rockets for towing and running mining operations. We haven't returned to the Moon since the mid-1970's, so it's unlikely we will have the technology to tow an asteroid close to Earth by 2025. What we have here are a bunch of greedy individuals who probably drank a little too much liquor during lunch. There’s gold in them there hills. You know, those ones floating around in space. Asteroids contain many tons of precious metals, making them irresistible to scientists, aerospace engineers, futurists, fiction writers … and tech billionaires. A group of wealthy, adventurous entrepreneurs will announce on Apr. 24 a new venture called Planetary Resources, Inc., which plans to send swarms of robots to space to scout asteroids for precious metals and set up mines to bring resources back to Earth, in the process adding trillions of dollars to the global GDP, helping ensure humanity’s prosperity and paving the way for the human settlement of space. Eric Anderson, founder of commercial space tourism company Space Adventures, and co-founded a new company along with Peter Diamandis said. Diamandis started the X Prize foundation, which offers prize-based incentives for advanced technology development. Nearly 9,000 asteroids larger than 150 feet in diameter orbit near the Earth. Some could contain as much platinum as is mined in an entire year on Earth, making them potentially worth several billion dollars each. The right kinds of investment could reap huge rewards for those willing to take the risk. Outside of NASA, Anderson and Diamandis are among the most likely candidates to realize such a dream. Space Adventures has sent seven private tourists to the International Space Station while the Ansari X Prize led to a spurt of non-governmental manned spaceships. Despite the promise of astronomical profits, the long time-scales and uncertain return on asteroid mining has historically driven most investors away from such undertakings. But the new company is also backed by a number of other billionaire luminaries, including Google’s CEO Larry Page and executive chairman Eric Schmidt, former Microsoft chief architect Charles Simonyi, and Ross Perot Jr. The venture also counts on filmmaker James Cameron, former astronaut Tom Jones, former JPL engineer Chris Lewicki, and planetary scientist Sara Seager as advisers. Still, this new undertaking will be much larger and more ambitious than anything Anderson and Diamandis have attempted before. The hurdles are many and high. While the endeavor is technically feasible, the technology has not yet been developed. And beyond their initial steps, the details of Planetary Resources’ plans remain scarce. The first hurdle will likely be ensuring that Planetary Resources has covered all its legal bases. While some have argued that governments need to set up specific property rights before investors will make use of space, the majority of space lawyers agree that this isn’t necessary to assure the opportunity for a return on investment, said space policy analyst Henry Hertzfeld at George Washington University in Washington D.C. Mining occurs in international seabeds — even without specific property rights — overseen by a special commission dedicated to the task, he said. A similar arrangement would likely work in space. In terms of extraction, Planetary Resources hopes to go after the platinum-group metals — which include platinum, palladium, osmium, and iridium — highly valuable commodities used in medical devices, renewable energy products, catalytic converters, and potentially in automotive fuel cells. Platinum alone is worth around $23,000 a pound — nearly the same as gold. Mining the top few feet of a single modestly sized, half-mile-diameter asteroid could yield around 130 tons of platinum, worth roughly $6 billion. Within the next 18 to 24 months, Planetary Resources hopes to launch between two and five space-based telescopes at an estimated cost of a few million dollars each that will identify potentially valuable asteroids. Other than their size and orbit, little detailed information is available about the current catalog of near-Earth asteroids. Planetary Resources’Arkyd-101 Space Telescopes will figure out whether any are worth the trouble of resource extraction. Within five to seven years, the company hopes to send out a small swarm of similar spacecraft for a more detailed prospecting mission, mapping out a valuable asteroid in detail and identifying rich resource veins. They estimate such a mission will cost between $25 and 30 million. The next step — using robots to remotely mine, possibly refine ore, and return material to Earth safely — is probably the toughest phase, and Planetary Resources is still tight-lipped about its plans here. This is an unprecedented challenge — the only asteroid material ever returned to Earth comes from the Japanese Space Agency’s Hayabusa spacecraft, which successfully returned a few hundred dust particles from asteroid 25143 Itokawa in 2010. One possibility might be to find a useful asteroid and push it closer to Earth. A fairly low-power solar-electric ion engine could nudge a hunk of rock into orbit around the Earth, effectively creating a small second moon that could be easily accessed. A recent white paper (.pdf) written by a team of scientists and engineers for the Keck Institute for Space Studies looked at exactly this proposition in order to use an asteroid for scientific and manned exploration. The team concluded that the technology exists, though such a plan would need at least $2.6 billion in funding. If Planetary Resources went this route, it would rack up a large initial investment, which doesn’t include actually mining and returning material back to Earth, potentially adding many hundreds more millions of dollars. JPL engineer John Brophy, who co-authored the paper said. Another option to simplify the process might be to bring the ore back to Earth for refining, though that presents its own set of challenges. Say for the sake of argument that you send a 5,500-pound robot (roughly the weight of a small car) to an asteroid and it can mine and carry back 100 times its own weight in asteroid material. On most asteroids, chopping up a one-ton chunk of regolith will generate less than an ounce of platinum. Even asteroids with the highest concentration of platinum yield only about two ounces of platinum per ton. This means that with the current commodity prices, each of your robot miners will generate about $875,000, even on an asteroid with the highest platinum amounts. Given a mission cost that is at least hundreds of millions of dollars, it wouldn’t be advantageous to refine ore on Earth. There are also unknown financial aspects of a successful asteroid mining operation. The sudden influx of hundreds of tons of platinum into Earth’s economy would certainly drive the commodity’s price down. Looking at historical analogues, the enormous gold and silver reserves the Spanish inherited from their New World conquests led to terrible inflation and possibly the decline of their empire. But Planetary Resources sees a platinum price drop as one of its potential goals. Aluminum was incredibly expensive in the 1800s, before new technology allowed it to be easily separated from its ore, said Diamandis. Today, aluminum is used in hundreds of applications, something that Anderson and Diamandis would like to see happen to the platinum-group metals. While mining platinum and other rare metals is Planetary Resource’s way of bringing wealth to Earth, the world still has ample reserves of such material — South African platinum mines alone are expected to produce for another 300 years. Asteroids contain one substance that is of extremely high value for astronauts: water. Water can be used for drinking and it can be broken into its constituents. Oxygen is valuable for life support in space-based habitats, while liquid oxygen and hydrogen are both used to produce rocket fuel. Rather than having to lug all the fuel for a mission out of Earth’s deep gravity well — an expensive proposition — having a “gas station” in space could help enable missions to Mars and beyond. Such a refueling depot might allow people to permanently live and work in space, another goal of Planetary Resources. Of course, this creates a sort of chicken-and-egg problem. Do you generate tons of resources for your nonexistent space civilization first or do you get your space civilization started and then utilize the available resources? Wired Science’s resident space historian David S. Portree thinks asteroid mining might make more sense when we have a more established space-based habitats with a different economy and better technology. COMMENTARY: The idea of sendiung robots to mine asteroids for their valuable metals like platinum and gold is complete and total science fiction, and the economics just don't seem to make any sense. I wonder how Google CEO Larry Page and Eric Schmidt got suckered into financially backing Planetary Resources useless idea? Mother Earth as seen from outer space by the International Space Station crew. Om nom nom nom nom nom nom nom nom. *Gulp. A funny thing has happened in the way well-meaning greenies talk about the earth. Call it the Al Gore effect: Faced with so many climate skeptics who deny the reality that 99% of scientists back global warming, the greenies typically resort to more and more wonkish sorts of communication. As if proving the climate skeptics wrong were simply about showing more and more data. The result, of course, is that the well-meaning message becomes harder and harder to comprehend. It seems to me that there’s no convincing people who’ve already made up their minds. Instead, you need to reach people who simply haven’t paid attention. How do we balance the needs of a growing population with a finite planet? By the year 2050, our planet will be home to another 2 billion people. How will we feed them all? Not only will there be more people, but everyone will have more money to spend on food. Where, on an increasingly crowded planet, will we grow all of it? Picture what would happen if we could freeze the footprint of food by doubling the productivity of farming. We already use 1/3 of the earth’s surface to grow food. By 2050, we’ll need twice as much food. Do you know what goes into making your laptop? Raw materials for electronic goods are mined from tropical rainforests, but as resources dry up, recycling aluminum is key. If a laptop manufacturer only used recycled aluminum, it would take 90% less energy to make the same machine. Imagine what our world would like if more products recycled or reused existing materials. COMMENTARY: After viewing the above videos, it becomes obvioius that we must create a sustainable planet. We should strive to recycle everything. We should strive to give back as much as we take from Mother Earth. We obviouslhy need to grow food crops more efficiently with a whole lot less water. In a blog post dated November 12, 2011, I told you about Dyson Award winner "Airdrop" irrigation system, an ingenious device that draws water from the air. In a blog post dated August 3, 2011, I told you about Pod Ponics, a small startup, uses hydroponic "growing pods" to produce fresh, locally-grown vegetables year-round. As fuel prices go up, the cost of shipping produce thousands of miles away rises accordingly. In the past few years, a number of companies have attempted to capitalize on the increasing hunger for locally produced food--we've seen rooftop farming startup BrightFarms and Brooklyn hydroponic farming startup Gotham Greens, just to a name a couple. In a blog post dated June 10, 2011 I told you the history of U.S. oil imports, prices, production, consumption, world oil reserves and events affecting oil prices. In June 24, 2011, I told you where the world's oil is produced, how much of that oil the U.S. imports, and why America goes begging for oil. February 5, 2011, I warned you that the oil consuming world is at peak oil levels, a level of oil consumption where we are using more oil than is being pumped out of the ground by the world's oil producing countries. In a blog post dated September 30, 2011, I commented on how for the first time in a quarter century, The Obama administration had successfully raised CAFE standards for light-duty vehicles, from 27.5 mpg in 2010 to 39 mpg in 2016. By 2025, cars will have to get 54.5 miles per gallon. Hybrids currently only make up about three percent of light-duty stock on the road, but sales of hybrids are growing. Consumers could save $1.7 trillion over the life of new CAFE standards by driving more fuel efficient vehicles, hybrid and all-electric automobiles. Check all my blog posts on Renewable energy and green technology. Renewable energy and green technology from the sun, wind and oceans needs to be harnessed and we should strive to to get off our addiction to oil by gradually switching from fossil fuel driven automobiles to hybrids and all-electric vehicles. The more advanced human kind becomes, as we develope better and more efficient technologies, from laptops to smartphones to tablets to apps, we seem to forget that there is a huge cost, to our environment and Mother Earth's resources. The aluminum in our laptops is a great example. We take too much for granted without taking account the consequences. Think your electricity bill is high? It's not. Neither is your heating bill or the price you pay at the pump. In the grand scheme of things, in fact, you're getting a great deal. Gas costs too much. So does heating oil. And electricity. 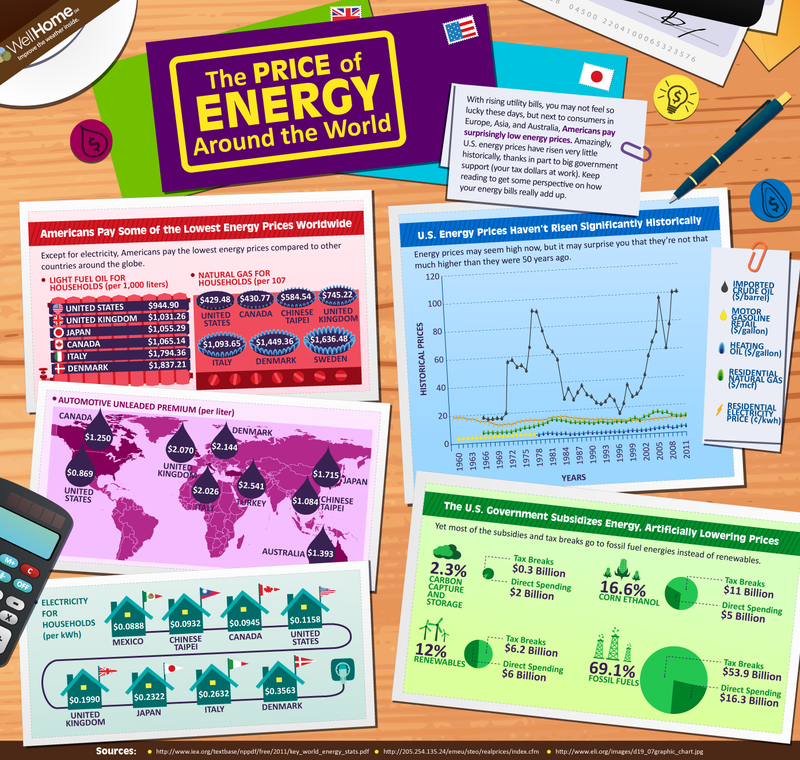 Americans love to complain about the cost of our energy. On the campaign trail, politicians love to offer policies that will lower it. But, as we've heard time and time again, our energy prices are actually blissfully low when compared to the rest of the world. Would it be nice if gas were cheaper? Certainly. But try telling a fellow in Europe what you pay to fill up and he'd probably offer you a hearty congratulations (before laughing at you about your gas mileage). Is knowing how well-off we are compared to the rest of the world going to quiet the incessant drumbeat about high energy prices? Certainly not. That would be un-American. Check out the whole infographic below or see it here. COMMENTARY: Now that you know how much energy costs outside the U.S. maybe you will start your complaining. We still need to get off this addiction on foreign oil and dependency on oil from countries that really don't like the U.S. too much. Let's go solar, wind and natural gas. Are you with me??!! Home is a 2009 documentary by Yann Arthus-Bertrand. The film is almost entirely composed of aerial shots of various places on Earth. It shows the diversity of life on Earth and how humanity is threatening the ecological balance of the planet. The movie was released simultaneously on June 5, 2009 in cinemas across the globe, on DVD, Blu-ray, television, and on YouTube, opening in 181 countries. The film was financed by PPR, a French multinational holding company specializing in retail shops and luxury brands, as part of their PR strategy. The documentary chronicles the present day state of the Earth, its climate and how we as the dominant species have long-term repercussions on its future. A theme expressed throughout the documentary is that of linkage—how all organisms and the Earth are linked in a "delicate but crucial" natural balance with each other, and how no organism can be self-sufficient. The first 15 minutes include footage of the beginning of the natural world, starting with single-celled algae developing at the edges of volcanic springs. By showing algae's essential role in the evolution of photosynthesis, it also explores the innumerable species of plants which all have their origins in this one-celled life form. In the rest of the first hour of the film, the documentary takes on a more human-oriented focus, showing the agricultural revolution and its impacts, before moving on to talk about the harnessing of oil, leading to fire, industry, cities and inequality gaps like never before. It portrays the current predicament regarding cattle ranches, deforestation, food and water shortages, the use of non-renewable "fossil water", the over-quarrying crisis and the shortage of energy, namely electricity. Cities such as New York city, Las Vegas, Los Angeles, Shenzhen, Mumbai, Tokyo and Dubai are used as examples of the mismanagement and wastage of energy, water and food. The recession of marshlands and glaciers are shown in vast aerial shots of Antarctica, The North Pole and Africa, while mass emigration and refugee counts are shown currently and forecast in the event that these events remains unchanged. Here, about three minutes of film is given to displaying harsh facts in large white text on a black background followed by a video representation of the fact. This is followed by a positive conclusion. The documentary claims to show the "awful truths" regarding our impact on the Earth, but also what we are now doing to combat and reverse it: including renewable energy, the creation of more and more national parks, international co-operation between various nations on environmental issues and the extra education and reform being had across the globe in response to the current problems facing the earth. Home was filmed in various stages due to the expanse of the areas portrayed. Taking over eighteen months to complete, director Yann Arthus-Bertrand and a camera man, a camera engineer and a pilot flew in a small helicopter through various regions in over fifty countries. The filming was done using high-definition "Cineflex" cameras which were suspended from a gyro-stabilized sphere from rails on the base of the helicopter. These cameras, originally manufactured for army firing equipment, reduce vibrations helping to capture smooth images, which appear as if they had been filmed from crane arms or dollies. After almost every flight, recordings were immediately checked to ensure they were usable. After filming was complete, Besson and his crew had over 488 hours of footage to edit. To promote the documentary online, a YouTube channel known as "HomeProject" was created. Uploaded to this were various short clips of filming which took place in different parts of the world including the Arctic Circle, Africa and the large metropolises featured. On March 9, 2009, a press-conference was held in Paris, France, where Yann Arthus-Bertrand and various producers talked to the media about the issues raised in the film, as well as confirming that Home would be the first film ever to be simultaneously released in theaters, on television, on DVD and on the Internet in five continents. On May 5, 2009, a second press-conference was held again in Paris, where the same crew members announced that the film's release date would be June 5, 2009, World Environment Day. Here, they also announced that Home would be 100% free for everyone to view, as "The benefits of this film cannot be counted in dollars, but in audience figures." They also revealed that PPR, was going to sponsor the film in order to facilitate unavoidable costs. The film, which was available for free release until June 14, has been broadcast in 14 languages. The Blu-ray edition was released by 20th Century Fox and features both the English and French versions. It is expected to sell in excess of 100,000 copies. When production costs are met, all proceeds sale takings will go to the Good Planet Company. Yann Arthus-Bertrand said in a TED talk that the movie has no copyright: "This film have no copyright. On the fifth of June, the environmental day, everyone can download the movie on Internet. The film is given for free to the distributor for TV and theater to show it the five of June. There is no business on this movie. It is available for schools, cities, NGOs and you." Nevertheless, a copyright notice appears in the final credits. Several high resolution editions of the movie are available for download, but none have been found marked with any kind of redistribution right such as a Creative Commons license. ClearBits, an online digital media community, provides a torrent of the 93-minute version in high-definition MP4 format, and Archive.org and Vimeo also offer high resolution editions. The film received a large response upon release, receiving over 400,000 combined views within the first 24 hours on YouTube. As of April 2010, the French, English, German, Spanish, Russian and Arabic versions on Youtube logged a total of more than 14 million views. It was shown to high ratings on channels around the world including the international network National Geographic. France2 débuted the film to over 8.3 million viewers in France alone. In India, Home was shown exclusively via the STAR World cable network. Generally, the movie was praised for its visuals but received criticism regarding the attitude of the narration and the contradiction between its message and the sponsors' legacy. Jeannette Catsoulis of the New York Times criticizes the film's narration and Glen Close, narrator in the English version, both regarding content and style: "We’ve heard it all before, if not in the schoolmarmish tones of Glenn Close, whose patronizing narration [...] makes the film feel almost as long as the life of its subject." Furthermore, she denounces the film's accusations towards the modern "lifestyle that 'destroys the essential to produce the superfluous' — an accusation that the film’s bankrollers, led by the corporation behind luxury brands like Balenciaga and Gucci, are probably familiar with..."
Jean-Michel Frodon, a French movie critic, expressed the opinion that "‘Home’ had many viewers but didn’t have much echo" because Arthus-Bertrand’s personality, activities and his innovative no-cost concept have captured more attention than the movie itself. COMMENTARY: Today is June 1, 2011, and something real odd is happening, America and the rest of the World is the midst of an environmental nightmare. Here at home we are experienced drought, torrential rains, floods, tornadoes and extreme changes in temperatures that have not been experienced in recent memory. Here where I live it rained and the temperatures during the day are in the 60's and fall into the 40's at night, and I live in California. It's supposed to be in the 80's to 90's this time of year. This is not supposed to happen. Already over 500 people have been killed by the tornadoes stretching from the southwest to the east coast. Millions of acres have been lost along the banks of the Mississippi River, the result of torrential rains that the areas has not experienced in nearly 100 years. What is going on? Many noted meteorologists are now saying that the World has reached a critical tipping point, and that we are now entering the beginnings of the new era of Global Warming and potential for a greenhouse effect, where the air will be filled with moist carbon-dioxide laden, cold and warm air, extreme winds and tornadoes, floods, snow storms and drought. Eventually the environment will become like a sauna, temperatures will climb into the 100's of degrees even at night. Plant life will die, and finally manking will ends. This is happening everywhere now, not just in the U.S. I am posting HOME, because when I first saw the film back in 2009 it truly awakened me to the fact that mankind is the problem, and yet we talk about global warming and the greenhouse effect, but not much is being done about it. Sure, we have cut back on oil consumption, but the price of gasoline, now over $4.00 per gallon in the U.S. is more the cause. We are investing billions in alternative forms of energy: wind, solar, all-electric and hybrid automobiles. But, this only accounts for about 6% of America's energy needs. America nad the world needs to do more. Watch HOME, and if you are not deeply affected by the message of global warming and the future of Planet Earth, then let us know what you think. Parents, show HOME with your kids. Make it a family event. Since he was hired in the '70s by Saudi prince Mohammad al-Faisal, French engineer Georges Mougin has tried to figure out a way to tow freshwater icebergs across the Arctic. Now, with 3-D tech, declassified satellite data, and tugboats, he might have cracked the way to quench the world's thirst. There are 1.1 billion people in the world without clean drinking water. Meanwhile, billions of gallons of freshwater disappears uselessly into the ocean, the result of icebergs that break off from the ice caps of Greenland and melt into the salty mix. Do you spot an inefficiency in the system here? So did French engineer Georges Mougin. And that's why he's invented a system for towing icebergs across the ocean and straight to the world's thirsty. Using 3-D technology, recently declassified satellite data, and the new science of oceanic forecasting, Mougin has created an elaborate method for hauling ginormous icebergs using a "skirt" and a tugboat. It might sound outlandish, but Mougin has been trying to tap the icecaps for decades. In the 1970s, Mougin was enlisted by prince Mohammad al-Faisal, a nephew of the Saudi king, along with other engineers and a polar explorer, in a venture called "Iceberg Transport International." Faisal planned on wrapping a 100-million-ton iceberg in sailcloth and plastic and tugging it from the North Pole to the Red Sea, though the cost was estimated at an exorbitant $100 million. For a swank conference on "iceberg utilization," he even managed to ship, via helicopter, plane, and truck, a two-ton "mini-berg" from Alaska to Iowa, where the giant block of ice was chipped apart to chill delegates' drinks. According to a Time report from October of 1977, Faisal predicted that he'd have an iceberg in Arabia "within three years." That didn't happen. The Iowa iceberg conference erupted into discord over price and feasibility. Thirty-five years later, though, Mougin thinks he can now succeed where Prince Faisal failed. Mougin partnered with a French design firm, Dassault Systèmes, which specializes in running elaborate 3-D simulations. Dassault had garnered some press after helping an architect explore a theory about the construction of pyramids. Mougin then got in touch with Cédric Simard, a project director at Dassault's Systèmes, thinking, says Simard, "Well, if they can help that architect with the pyramids, surely they can help me with my iceberg project." And indeed they could. The team spent months gathering data and building a virtual simulation that they felt truly modeled the real world. There were many parameters: the boat's fuel supply and the iceberg's melt rate, on the one hand, and then the countless variables of the fickle ocean itself--sea currents, swells, winds, and so on. What does towing an iceberg actually entail? Dassault gave us an exclusive look at some 3-D animated renderings. Here, then, is an illustrated guide on how to tow an iceberg. Step one: You can't just grab an iceberg any time of the year. "There is a season for harvesting icebergs, a bit like tomatoes," says Simard with a laugh. You'll want to consult a glaciologist. Also, you'll want an iceberg of the optimum size--not too big, but not too small--and shape. "When you think of icebergs, if you just ask people in the street, they think of icebergs with the shape of mountains." But a craggy, irregular iceberg is the last kind you want, if you're going to lug the thing across an ocean. You want a regular, table-shaped or "tabular" iceberg. That shape "truly facilitates towing," says Simard, "and is known by glaciologists as the family of icebergs which presents the minimum risk of fracture." Once you've found the proper Titanic-buster, have your tugboat (yes, a tugboat--more on that later) deploy a floating geotextile belt--made rigid by a series of poles--around the target, effectively lassoing the iceberg. The iceberg in the video above might not seem all that formidable. But recall the old saying about icebergs and their tips. Which brings us to step two: Deploy a geotextile "skirt" to snag the bulk of the beast and to keep as much as possible from melting away. The skirt, which deploys down to 20 feet below the surface of the ice, creates a cushion of cold water around the iceberg, which helps slow melting. And below the surface, icebergs are smoothed by ocean currents, making it unlikely the skirt will tear as it protects its cargo. And now the third and final step (theoretically): Tow that iceberg across the ocean before it melts away. A tugboat actually can't lug an iceberg all by itself; it's a question of harnessing the sea's natural forces. This is where satellite data and oceanic forecasting comes in. "Though it doesn't look like this when on a boat, from a satellite's perspective, [the ocean] looks like a big map of bumps and holes," explains Simard. Navigating those pockets, like a mogul ski slope, would be the key--if the towing were possible at all. And was it possible? Dassault Systèmes gathered all the data, built the 3-D world, and invited Mougin over as they pressed play on their simulation. On the first try, the results were disappointing. The iceberg got caught in a giant whirling eddy for weeks (of simulation time), melting away. But Mougin was stoic: "When you're an engineer, you have to measure your emotions," says Simard. "When something fails, you always know there is a reason." The team had chosen a simulated launch date that wasn't conducive to iceberg steering. If they adjusted the date by a few weeks, into a different part of the season, would the iceberg be able to escape that eddy? They altered that parameter, pressed play--and "it just worked," says Simard. The team even discovered that just a single tugboat could theoretically haul an iceberg. They say it's like a nutshell towing a mountain--and yet it's possible. For more details, Simard has been blogging of late on the wild scheme, or track down the documentary about Mougin's Fitzcarraldian dream, which is so far only for French TV. Emboldened by the successful Dassault Systèmes simulation, Mougin is forging ahead with a plan to implement his dream in the real world--he announced a new company to the French press recently. The cost of iceberg transport have not been made public yet, but pilot programs--initially just try to tow a mini-iceberg a short distance, says Simard--are underway. And there is talk, at least, of a real-world trial in 2012 or 2013. To the global thirsty, then, take heart: a mountain of water is looming on the horizon. COMMENTARY: That's one heck of an idea, but trying to drag a 100 million ton iceberg could be impossible. That would be like dragging 1,000 Nimitz class aircraft carriers. I just don't think that something that heavy can be towed. I also have a feeling that the iceberg will have greatly melted long before it reaches its final destination. Just the same, I wish Georges a lot of luck with that idea. Ethonomic Indicator of the Day: 45% -- The amount of fracked natural gas the U.S. will use in 2035. Natural gas is the good-looking younger brother to much maligned nonrenewable resources like coal and petroleum; it's still plentiful, and relatively low in greenhouse gas emissions (just ask T. Boone Pickens!). But the good-looking brother has a dark secret: getting gas out of the ground is a really, really dirty process. According to Methane and the Greenhouse-Gas Footprint of Natural Gas from Shale Formation, a soon-to-be-published paper in the Climatic Change Letters journal, natural gas produced from shale is actually responsible for spewing significantly more greenhouse gases than coal. The problem is high-volume hydraulic fracturing (aka "fracking"), which involves injecting a fluid at high pressures into methane gas deposits to draw out natural gas. Natural gas is largely made up of methane (a potent greenhouse gas), and over the lifetime of a well, 3.6% to 7.9% of its methane escapes into the atmosphere through venting and leaks. This is, needless to say, not good--methane is a much more powerful greenhouse gas than CO2. As a result, the study claims, "Compared to coal, the [greenhouse gas] footprint of shale gas is at least 20% greater and perhaps more than twice as great on the 20-year horizon and is comparable when compared over 100 years." So while burning natural gas emits fewer greenhouse gases than burning coal, the impact of fracking combined with burning natural gas is ultimately worse than the emissions from coal. This issue isn't going away anytime soon--the Energy Information Administration estimates that fracked gas will make up 45% of U.S. natural gas supply in 2035, compared with 14% in 2009. But there are solutions. The study suggests that better storage tanks and compressors, smart-automated plunger lifts, and vapor recovery units could all help clean up the fracking process. As could a new name that doesn't sound quite so evil. So far, the natural gas industry has shown little interest in adopting these technologies. And why should it? Everyone already thinks natural gas is better than coal; there's no reason why the industry would waste its money improving operations. COMMENTARY: According to the new Congressional Research Services (CRS) report, an updated version of a 2009 paper, the United States’ resources are larger than Saudi Arabia, China and Canada, combined. The report estimates that the U.S. has 163 billion barrels of recoverable oil and enough natural gas to meet the country’s demand for 90 years. According to the U.S. Energy Informaton Administration, the U.S. consumed 24.133 trillion cubic feet of natural gas in 2010. The U.S. had 6,731 trillion cubic feet of natural gas reserves at the end of 2010. There is enough natural gas to last 250 years at 2010 consumption levels. The world’s largest proven gas reserves are located in Russia. With the Gazprom company, Russia is frequently the world’s largest natural gas extractor. Major proven resources (in billion cubic meters) are world 175,400 - Russia 47,570 - Iran 26,370, Qatar 25,790 - Saudi Arabia 6,568 - and United Arab Emirates 5,823. The world’s largest gas field is Qatar’s offshore North Field, estimated to have 25 trillion cubic meters of gas in place—enough to last more than 200 year at optimum extraction levels. The second largest natural gas field is the South Pars Gas Field in Iranian waters in the Persian Gulf. Located next to Qatar’s North Field, it has an estimated reserve of 8 to 14 trillion cubic meters of gas. The U.S. is also ranked No 2 in world in natural gas from shale deposits. Natural gas shale deposits are plentiful and located throughout the U.S.
That's a hell of a lot of natural gas. I don't like spending $4.00+ for gasoline at the pump. Obama, we need to find a way to use natural gas so that it burns a whole lot cleaner.